“An ounce of prevention is worth a pound of cure.” Benjamin Franklin’s quote is as applicable today as it was when he first spoke the words. Many people think Franklin was referring to health, however, according to the letter he wrote to The Pennsylvania Gazette published on February 4, 1735, he was addressing fire safety. Benjamin realized that organization and planning before an emergency are crucial to the success of saving lives and property in the event of a fire. This forethought led to the creation of a Union Fire Company. 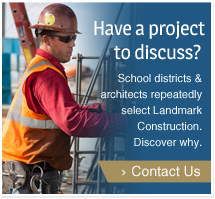 Just as Benjamin Franklin understood the importance of preventative care, so does Landmark Construction. In the construction industry today, risk management is of paramount importance. Risk management is defined as identifying and prioritizing risks in the workplace, followed by making changes to minimize and reduce those risks. Many companies implement a Safety Program in concert with risk assessment. At the recent SRBX Safety Expo held at Cosumnes River College, Landmark’s Safety Coordinator Joe Souza presented “Worker Safety & Risk Management for Employers 101”, during which he spoke on the topic of risk management and implementing a safety plan. This workshop, sponsored by Landmark Construction, discussed the hidden costs of worker injury, holes in insurance policies, and how to start the process of writing a safety plan. Not surprisingly, worker injuries are very expensive. The places in a business that they affect can, however, be quite a shock. The Department of Labor estimates that a single fracture can cost $95,291 in direct and indirect costs to an employer. What are some of the hidden costs of an employee injury? Injuries damage a business’s brand. It only takes one negative interaction with a company for the brand’s notoriety to go from positive to negative. Think of the BP Deepwater Horizon spills which had a catastrophic and long-lasting negative impact on BP’s brand name. Owners are increasingly requesting contractor safety records as part of the statement of qualifications process. A poor safety record can mean lower points and losing out on project opportunities. A single worker injury can also impact the recordable incident rate for a relatively small firm. These negative impacts are important to be aware of; in fact, they demand action. Managing risks is easier than many employers realize. A good place to start is to create clear, communicated expectations of what a safe work environment looks like and how each employee can – and should – contribute to instilling a culture of safety across the entire company.